Another Uppercase book that I finally decided to read...and the audiobook reader had an accent. We all know I'm a sucker for an accent. The description above sums things up pretty well. 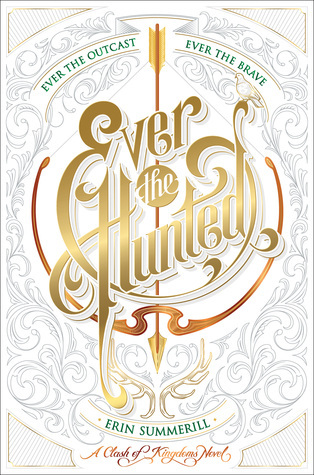 Ever the Hunted is a fantastical murder mystery - a young heroine with magical powers stuck in a kingdom where magic is outlawed. War is on the horizon, and the only thing standing between her and the noose is the man accused of killing her father. I feel I should preface the next few statements with the declaration that, in the end, I enjoyed this book. Seriously. Truly. I'm not just saying that to be nice. But...there wasn't anything new and exciting about it. I was convinced for the first half of the book that I had already read it. The characters were character I had met before, and the plot was just like the plot used a hundred times over in a variety of other books. It was formulaic and predictable. Britta could have just as easily been Alina from Leigh Bardugo's Shadow and Bone (without the fun and violence of the Darkling). And Britta was kind of whiny. I'm not a huge fan of whiny. I wanted her to be a bit more independent and fierce. Angrier I guess. But she became a blubbering mess as soon as a boy was around. Sure there is backstory and legit reasons to feel heartbroken, but still. I'll probably continue on with the story when the sequel is released. In the end, Britta has come into her powers and things started to get interesting. Hopefully she'll come into her own a little more in book two.